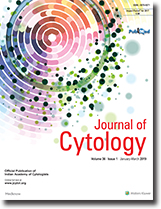 The study was undertaken to evaluate the role of ultrasound guided fine needle aspiration cytology (FNAC) of gastrointestinal masses in providing higher diagnostic yield and assess its reliability in distinguishing between benign and malignant gastrointestinal lesions. 86 patients with gastrointestinal masses after thorough clinical examination underwent ultrasonographic examination. Those found to have a mass were subjected to FNAC. 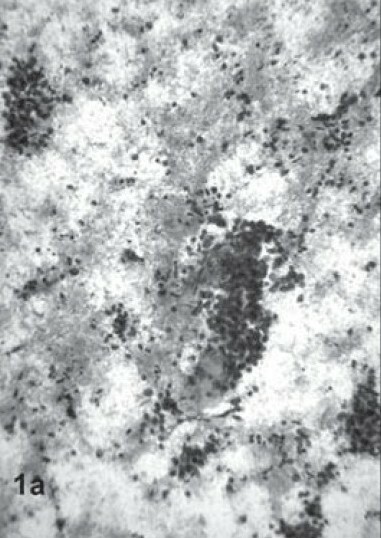 Smears prepared were fixed in 95% ethyl alcohol and stained with Haematoxylin and Eosin and Papanicolaou stains. Forty (46.5%) were males and 46 (53.5%) females with majority of patients in the third decade in both sexes. Malignant lesions constituted the maximum number of 42 (48.8%) cases, followed by 36 (41.8%) cases of benign and inflammatory lesions. Adenocarcinoma was the most common malignancy accounting for 36 (85.7%) cases; out of which 16 (44.4%) cases were adenocarcinoma stomach and 20 (55.6%) cases were adenocarcinoma intestine. Among the inflammatory and benign lesions, 30 (83.3%) cases were tuberculous followed by 4 (11.1%) cases appendicitis, The mean age of malignancy was 39.2 years and the average age of tuberculous patients in our study was 25.5 years. On cytohistological correlation, 30 were found to be true positive for malignancy, 5 true negative and 1 false negative. There were no false positive cases. We obtained a sensitivity of 93.8%, specificity of 100% and diagnostic accuracy of 94.4% in our study. Ultrasound guided FNAC is an effective and useful method which eliminates the need for surgical biopsy and provides sufficient information for the initiation of therapy. Human Papilloma virus (HPV) infection of uterine cervix is known to be a very important risk factor for the development of cervical intraepithelial neoplasia and invasive cancer. This infection, that affects partners, is presently being investigated mostly in females. 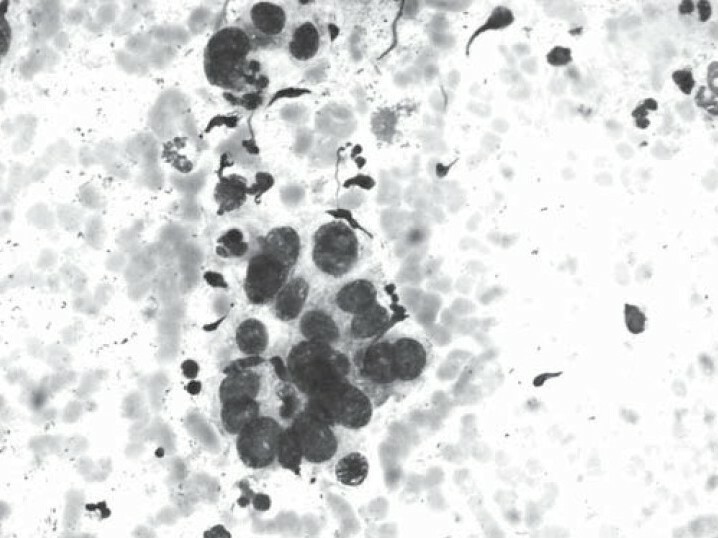 This study utilized a simple technique of urethral cytology and penioscopy to screen 38 male consorts of women with HPV infection of uterine cervix. A simple naked eye examination and examination under magnification of the male genitalia i.e. "Penioscopy" was performed. 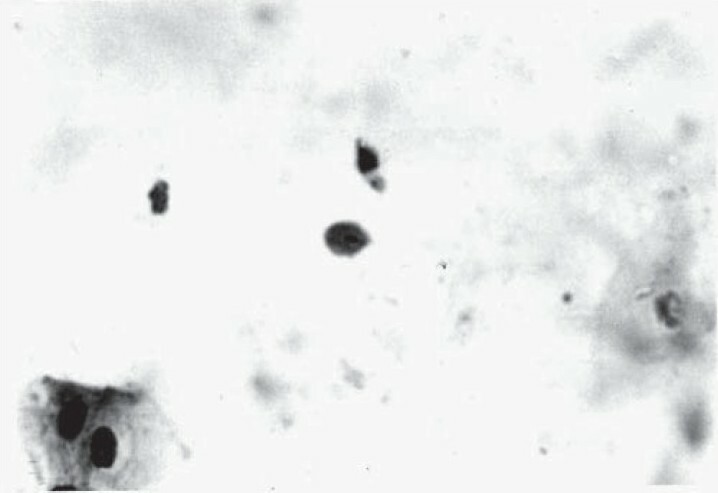 A cytologic smear was obtained from the urethra using a cytobrush. Five percent acetic acid was then applied and acetowhite areas, if any, were noted. Smears were studied for features indicative of HPV infection. 10 male consorts, all of whom were asymptomatic, showed evidence of HPV infection. We present a 55 years old lady having an unusual presentation of abdominal pain and a clavicular mass as the initial manifestations of a nonfunctioning malignant pheochromocytoma. Fine needle aspiration of the clavicular mass revealed a metastatic adenocarcinoma. 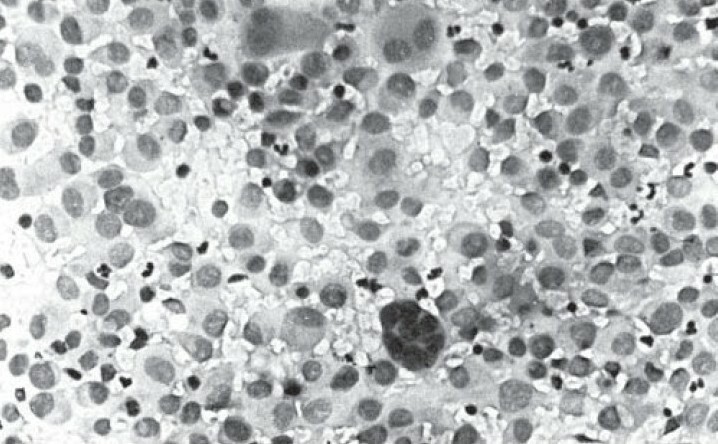 A search for primary site revealed a mass in left adrenal and multiple space occupying lesions in the liver. The aspirations were identical to that from the clavicle. Surgical biopsy of the clavicular mass revealed, features of metastatic pheochromocytoma. Urinary catecholamine was normal. Malignant pheochromocytoma can present with atypical features and guided fine needle aspiration cytology can be a safe diagnostic procedure. 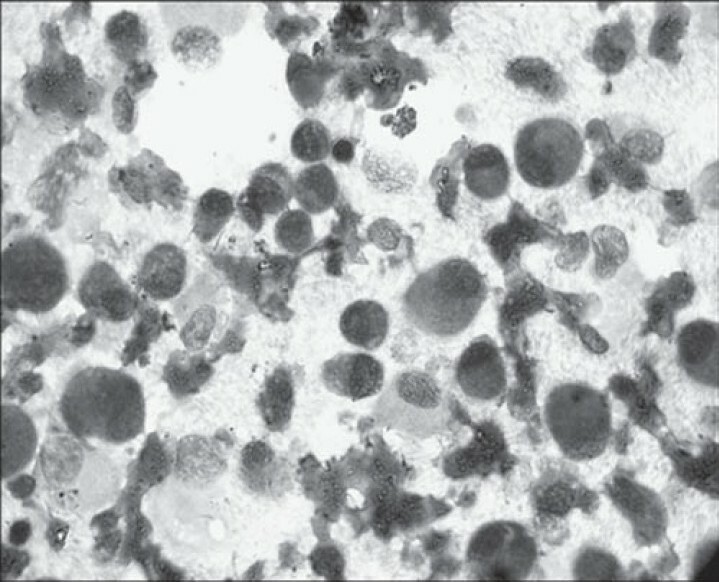 Aspiration cytology of lymph node of a one-year old girl suffering from acute disseminated Langerhans cell histiocytosis revealed pleomorphic histiocytes and multinucleated giant cells, including Touton like giant cells. 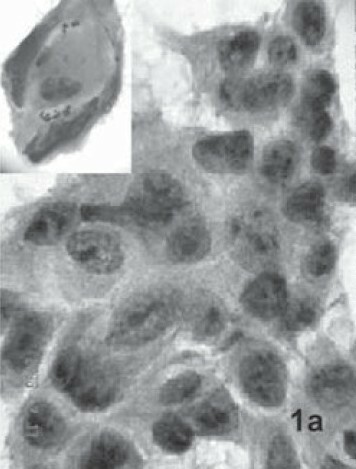 Histology of the same lymph node showed atypical histiocytes but no giant cell. We report this case because presence of Touton like giant cells in aspiration cytology smear of lymph node is a rare finding. Nodular fasciitis is an uncommon, benign myofibroblastic soft tissue tumour. It is infrequently seen in the hand. A case of nodular fasciitis involving the thumb of a 4-year-old male child is presented. Main significance lies in clinical and pathological recognition of the lesion to avoid over-treatment. 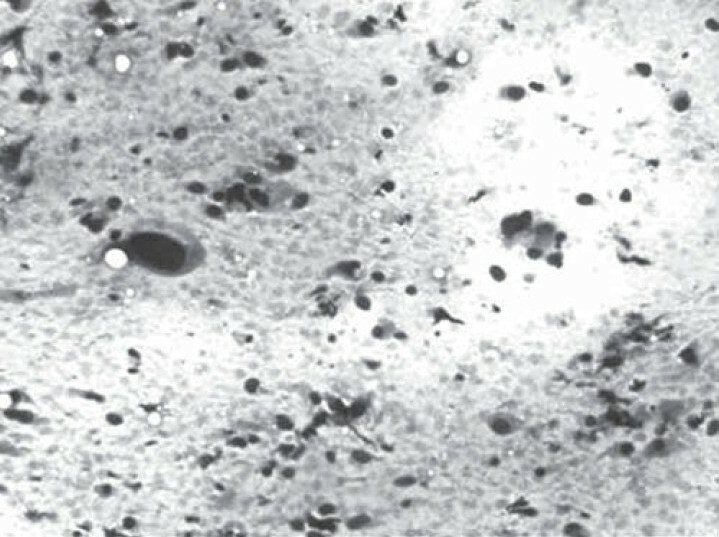 Nodular fasciitis remains a difficult diagnosis by fine needle aspiration cytology, particularly when it occurs in locations such as the hand. Cardiac tamponade is a life threatening condition. It is rarely the first sign of malignancy which can be diagnosed by cytological examination of pericardial fluid. 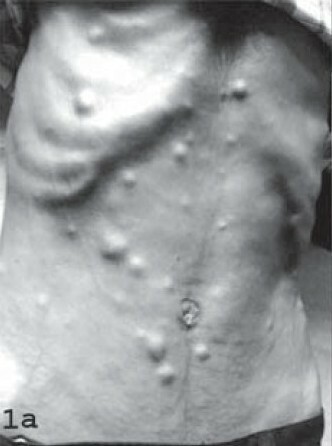 Subcutaneous metastatic nodules also are an uncommon first sign of underlying cancer. In this report we present a 62 years old case of lung cancer who initially presented with the above two rare clinical signs. He was admitted with cardiac symptoms, chest pain and dyspnea since last 6 months. Chest radiographs showed cardiomegaly and diagnosis of cardiac tamponade was made. Pericardiocentesis showed malignant cells, morphologically suggestive of an adenocarcinoma. 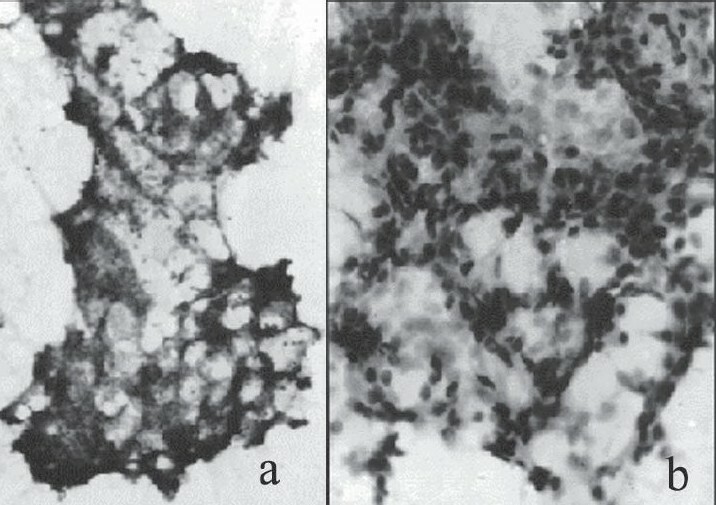 Fine needle aspiration of the subcutaneous nodules showed a similar picture. 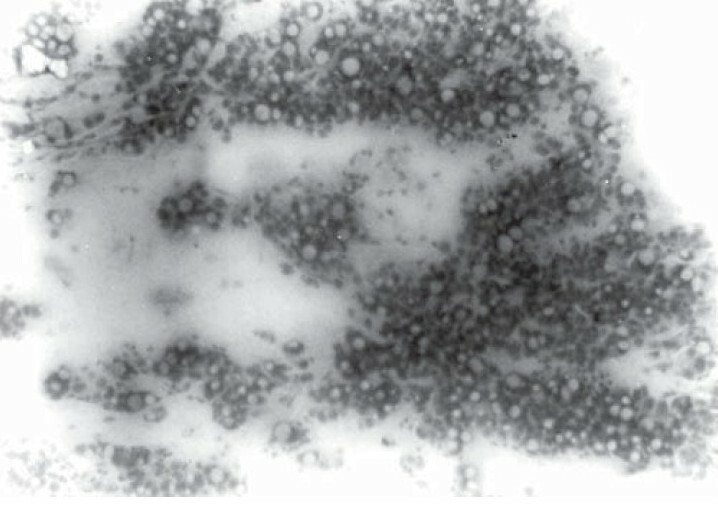 Search for the primary revealed a mass in the lung on computed tomography. 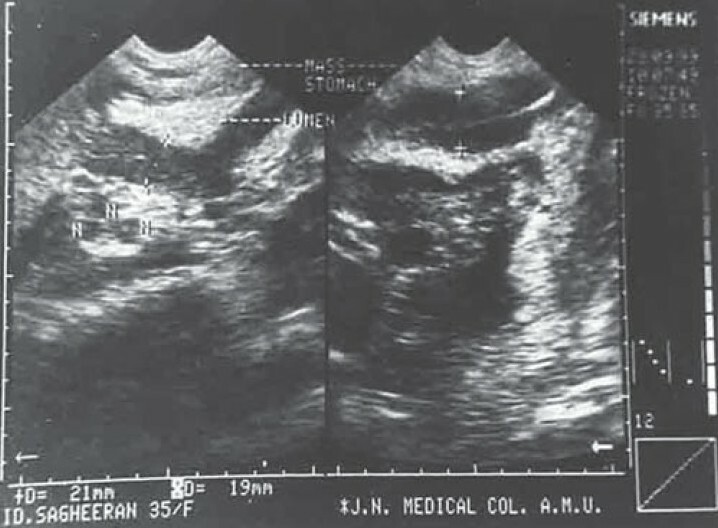 Metastasis of adenoid cystic carcinoma to the kidney is rare. We present a case of a 50 year old male with complaints and radiological findings suggestive of renal cell carcinoma and lung deposits. However, fine needle aspiration was suggestive of adenoid cystic carcinoma metastatic deposits. It was later elicited that the patient had undergone surgery for parotid tumour seven years back which on histology was an adenoid cystic carcinoma. The case is being presented for its rarity. Fine needle aspiration cytology (FNAC) is a very accurate and safe procedure for the diagnosis of breast malignancies. 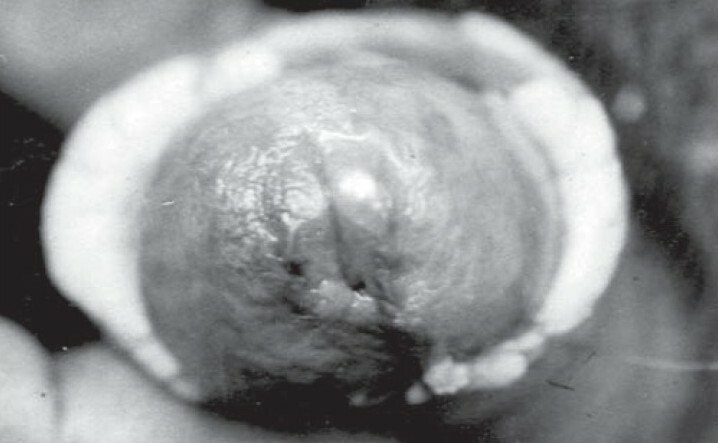 Although rare, the various malignant tumours like squamous cell carcinoma, metaplastic carcinoma and other types can be diagnosed by their cytomorphological characteristics. But there are certain limitations of FNAC which require final histopathological diagnosis for determining prognosis and therapy (particularly conservative) in patients of breast malignancies. The difficulties encountered, and limitations of FNAC in sub typing three cases of breast carcinoma are discussed. We report a case of pilomatrixoma of the posterior triangle of the neck in a twenty-eight year old gentleman, which was suspected as metastatic carcinoma on fine needle aspiration cytology. The cytomorphological features of pilomatrixoma and major pitfalls in diagnosis are also discussed.